If she has kids, they will adopt not her speech but the speech of their British school friends. If you come from an immigrant family, you’ll know how that works. She pronounces the silent ‘p’. The longer she spends in Britain, the more her pronunciation will even out and conform to the language community she finds herself in. But for the moment the young immigrant woman at the checkout in Sainsbury’s is operating, charmingly, in a language – English – that is still being assimilated. There’s no doubting the desire to learn and fit in, because the error is one of overcompensation. That pronunciation is about wanting to get her mouth correctly round every bit of the word, the way, when you were first learning French, you probably couldn’t resist pronouncing the ‘n’ in a third person plural verb like ‘parlent’. She’s trying hard to get everything just right. Clean nails, tidy hair. Smartly turned out in her uniform. Her accent, her colouring, the delicate crucifix necklace: they all suggest to me she’s from somewhere Catholic in Eastern Europe. I guess the country and say ‘thank you’ in its language. I once had a girlfriend from there. The guess is correct. She smiles. Not a corporate, retail-staff-training smile, where just the corners of the mouth are raised. This is a Duchenne smile (google it), where the muscles at the corners of the eyes contract. Real, not fake. She’s got a sense of how we do cheerfulness in these parts. I hand her a fiver. ‘Cheers, honey,’ she says, with smiling eyes and an emerging trace of an East End twang. She hands over the change. And my reseept. Migrants have played a major part in serving shoppers and shaping our retail environment for at least a hundred years. Asian corner shops have been a familiar part of British life since the 1960s. They’re now much less common than they were. The children of Asian shopkeepers are seeking new employment opportunities, and big retail chains have muscled in on the open-all-hours street corner convenience market. In some parts of British towns today you might well come across a Polski Sklep – selling Polish specialities. But there’s Polish heritage in mainstream retail too. 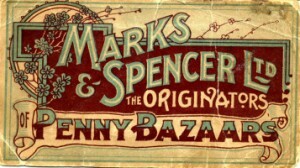 A Polish migrant, Michael Marks, founded Marks and Spencer as a market stall in a penny bazaar in Kirkgate, Leeds, in 1884. And Tesco was founded after World War One by Jack Cohen, the son of a Polish migrant. Love your posts, keep writing.